As most of you know, I have been thinking on this project since seeing it on She Known As Jess. I have participated in World Book Night and even donated books to our local Little Libraries. However, those two things are only temporary and reach very few people. So after careful consideration and lengthy conversations, I have decided to go ahead with this project. You Give=We Give is all about fostering the love of reading in everyone young and old. The purpose is to get as many books as possible in the hands of just as many people. She Known As Jess donates to the Kmart Wishing Tree in her area, however as there is not a Kmart in my area, I will be donating all books purchased and received to various locations. The local library, Wal-Mart, and Churches in the area. You can help make this event a huge success! I have set a goal of 200 books to be donated by December 10, 2015. You can donate books, or funds for books via PayPal by the donation link in the sidebar. All books donated will be showcased in upcoming blog posts, and books bought with donated funds will also be showcased. All contributors will be recognized in each blog post and also at the end of the event. My Chaotic Ramblings is my own creation, and the You Give = We Give event is the brainchild of She Known as Jess. It is open for the public to view. My blog was made so that I could publish my thoughts and opinions, for me to read and review books so that I could share my opinion with anyone who wanted to read it. I decided two years ago that I wanted to help place books into more readers hands if I couldn't read a book If I couldn't afford to purchase one I don't believe I would have the love for them that I do today. 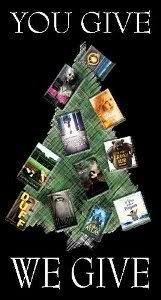 It was then that I decided that I would raise as many books through my blog around Christmas time so that people will experience what all of us bloggers, what all of us readers feel when we read a book. That if they see that we all have written blogs about our passion of books that they too can if they choose - no one should feel like Christmas can't be special, that they aren't special because everyone is and to open a page to a book is to open a page into one's imagination. I assure you that I am 100% Genuine, and this event is to brighten up someone's life, that we care about strangers who deserve to open a book just as much as we do. I want to make that happen.